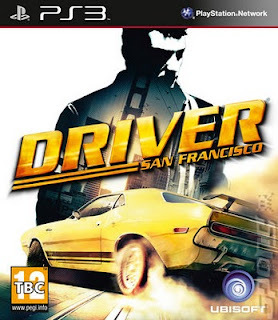 So, my awesome super sweet girlfriend just bought me Driver: San Francisco for the PS3. :) I know, I haven't written a review in awhile so please excuse me if I'm a little rusty. Ah, the Driver video game series, being an avid car fan and racing game enthusiast, my gaming "career" would not be complete without this series. Making its debut in 1999 on the PlayStation, I was already hooked by the concept of the game which involved epic car chases, realistic damage physics (for its time), free roaming the city environment and a gripping storyline. Although it lacked a few things such as vehicle choices and the ability to get out of your car (which was later corrected in Driver 2, released in the following year). This game represents the 5th installment of this series (Driver, Driver 2, Driv3r, Driver: Parallel Lines and now, Driver: San Francisco). There has been a huge gap between the last game which was released in 2006 on the PlayStation 2. I have actually been waiting for them to make one for the PS3 and now that there is, after finding out the Ubisoft would be behind the game, I was excited to see what they have in store for us this time around on a new platform. And I am happy to say that I wasn't disappointed at all. First off, I would like to thank http://gametestlabs.com for posting if not all, at least the majority list of cars that would be available for use in the game. (I usually check what toys can be used before I play a racing game, adds to the pre-play excitement.) And boy did this list excite me! Names like Lamborghini, McLaren, Jaguar, RUF, Aston Martin, Audi, to name a few, will be available for use within the game, these are just a few out of the car list that was provided. Now, onto the game, don't worry, I hate spoilers, so there won't be any here. There are three new interesting additions to the game. First is the "Shift" or car-hopping principle of the game which allows a player to kind of "possess" other drivers, it's pretty much John Tanner's soul floating above the entire map, you focus on a car, any car and then BAM, possess the driver in it, I know it's kind of freaky. But that's a new twist that unfortunately replaces the concept of getting out of your car (you'll need to play the game and go through the story to find out why it's no longer possible to do so.) It has its ups and downs, the upside is, you get to "shift" without consequence pretty much possessing whatever the heck you like. The downside, for me is that this kind of takes out the thrill and excitement of having to get out of your car, run around the city in search of a new vehicle because you wrecked what you're currently using. But the reason for this new feature was justifiable enough for me to go along with it. I believe it adds a new element of fun into the game though, somewhat breaks the monotony and makes it kind of stand out. The second addition is the Garage concept, which for car fanatics such as myself is a nice addition because this allows to you to purchase garages, wherein you can buy cars, store cars and upgrade your driver abilities, you also get to access movie car chase scene remakes and other driving challenges from here too. Lastly, the addition of a multiplayer area of play which includes online play as well as split screen play which is a pretty sweet addition. I believe this gives the game a huge boost because online play is interactive and with various modes to choose from, the replay value of this game is quite high and to top it off, incorporated into the multiplayer is the "Shifting" principle which can be used to your advantage in order to succeed. It adds an element of challenge and unpredictable excitement because after all, you are going against other real people as opposed to AI. Upon starting the game, you will be treated to graphically pleasing cutscenes that switch in and out of you controlling it and watching it which is pretty exciting, the main idea of the story is immediately introduced so you won't be lost, then after the pleasantries are out of the way, the fun begins. Being a Ubisoft developed game, I can't help but see a little bit of Sam Fisher in John Tanner, but that's just me. Although the in game graphics are not as graphically jaw dropping compared to Need For Speed or Gran Turismo, it provides pretty decent detail and damage physics. And I must say, once you get used to the whole "shifting" idea, you discover endless possibilities and get to watch and control them through an out of body experience, no pun intended. I can't really go into detail about this because I promised no spoilers, so if you want know more about it, go grab yourself a copy of the game!